Serena Williams won her second career Emirates Airline US Open Series title in 2013 and will lead an array of stars returning to the Series this summer. The road to the US Open starts at the 2014 Emirates Airline US Open Series – and you can be there to catch the action in person. Tickets for all tournaments in this year’s Series will be on sale starting June 9, giving you the opportunity to see the best players in the world competing in an event near you. Celebrating its 10th anniversary in 2014, the Series links eight summer hard-court tournaments to the US Open, providing the top stars a series of stages on which to test their skills prior to the season’s final Slam. Current world No. 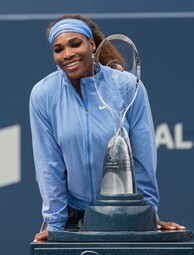 1s and reigning US Open champions Rafael Nadal and Serena Williams won the 2013 Emirates Airline US Open Series men’s and women’s titles and figure to again contend for the Series’ top spots. Adding to the excitement of this year’s Series will be two new sweepstakes for fans to enter. The first is open to anyone who submits an entry form that will be available on EmiratesUSOpenSeries.com from June 9 to June 30, with the winner receiving a VIP experience to the 2014 US Open including two tickets to the Open, travel to the event, hotel accommodations and an opportunity to dine in the Players’ Lounge inside Arthur Ashe Stadium. Also starting June 9, fans can enter for a chance to win VIP treatment at the Series event of their choice (the Rogers Cup in Montreal not included). To qualify for the Series VIP package, fans need only submit an entry form or buy tickets for that event. Official rules will be available on EmiratesUSOpenSeries.com starting June 9. For more information and the complete 2014 Emirates Airline US Open Series schedule, please click here.